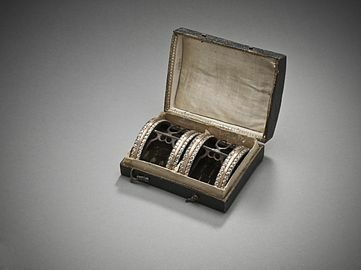 Buckled shoes began to replace tied shoes in the mid-17th century: Samuel Pepys wrote in his Diary for 22 January 1660 "This day I began to put on buckles to my shoes, which I have bought yesterday of Mr. Wotton." The fashion at first remained uncommon enough though that even in 1693 a writer to a newspaper complained of the new fashion of buckles replacing ribbons for fastening shoes and knee bands. 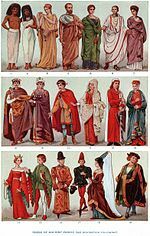 Separate buckles remained fashionable until they were abandoned along with high-heeled footwear and other aristocratic fashions in the years after the French Revolution, although they were retained as part of ceremonial and court dress until well into the 20th century. 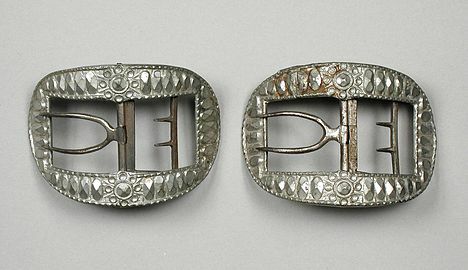 In Britain in 1791 an attempt was made by buckle manufactures to stop change in fashion by appealing to the then Prince of Wales Prince George. While the prince did start to require them for his court this didn't stop the decline of the shoe buckle. 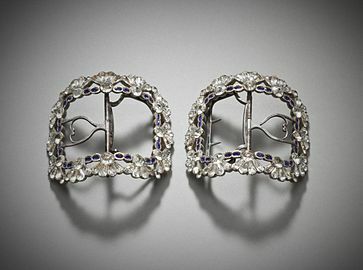 It has been suggested that the decline drove the manufacturers of steel buckles to diversify into producing a range of cut steel jewellery. Knee buckles are used to fasten the knee-high boots just below the level of the knee. ^ a b c d Clifford, Anne (1971). Cut-Steel and Berlin Iron Jewellery. Adams & Dart. pp. 18–19. ISBN 9780239000699.